My Vestvember project is complete! 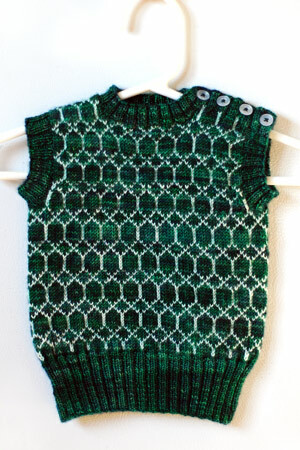 Pattern: Archie Vest from Kristen Rengren’s Vintage Baby Knits (my review/preview here). Yarns: Madelinetosh Sock in malachite and Lorna’s Laces Shepherd Sock in natural (0ns). I used a bit more than half a skein of the malachite (please note: Madtosh Sock is a big, 100-gram skein), and about half a skein of the natural (typical 50-gram skein). I was very pleased to use up some stash yarn for this project. I picked up the malachite at a friend’s destash sale about a year ago, and the natural is from Birds ‘n Yarn, purchased who-knows-when for some project which never materialized. Needles: US 1 for the ribbing, and US 2 for the colorwork, 16″ circs and dpns. Finished size: 17″ chest circumference, 10.5″ from shoulder to hem. I followed the book’s instructions for the smallest size, but because my gauge was a little bit tighter than recommended (about 9.25 spi and 40 rpi in color pattern), this wee vest is only 17″ around the chest. Wow, I don’t think I’ve ever made anything quite so small! This is truly newborn size, and will be perfect for a little baby born during this winter. Though I made some modifications to the knitting instructions, I stayed true to its overall design: it’s ridiculously adorable! As I mentioned earlier, I knit the vest in the round until the armholes. I also added a button band along one of the shoulder seams because the neck opening looked absolutely teensy, even before adding the ribbing. I knit the button bands and the neck ribbing as one continuous strip, working increases where the two would typically meet to create a pivot. The buttons are from the stash, and are ever-so-slightly different from one another (Shhh! Don’t tell the mom! I don’t think she’ll be able to tell anyway.). This was my first time working with Madelinetosh Sock yarn, and I really enjoyed the deep, saturated, and rich malachite colorway. The dye did come off on my fingers as I was knitting, and the yarn bled quite a bit when I blocked the vest. Not enough to stain the towel on which I laid the vest to dry, and not enough to visibly fade in color (though who knows what will happen after 10 additional washes). I think some of the dye bled onto the white Lorna’s Laces yarn, but without high heat and a setting agent, I don’t think the change was drastic. I will advise the mom against wearing this vest on top of, say, a fancy white button-down shirt (ha! ), because I think it would pick up some green around points of friction, like the armholes. I think you can see here how the two yarns have no interest in sticking to each other, at all. Steeking would have been tricky, indeed. 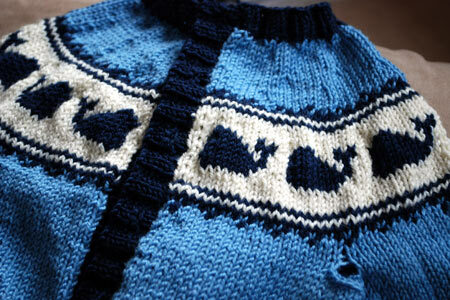 It’s the Pod of Cetaceans Cardigan by Elinor Brown! It has wee whales! I’m close to being done, though a last-minute misreading of the instructions had me ripping back both button bands and the collar last night. Le sigh. Stay tuned for some FO pics! Not to worry about color bleeding onto a fine white button-down shirt, Kathy. Newborns don’t wear button down shirts. oh, that vest is adorable! what a lucky baby. the color is so rich and the cream really sets off the variegation. the whale sweater is so cute too – my sister once knit a cute hat for my son with a similar whale motif, so east-coast and sweet! Masculine and bright! What I always yearn for in a baby boy knit. Thanks so much! stranded with purling! I’m impressed, and also glad to hear it wasn’t so so bad. Thanks for the info on the malachite bleeding. 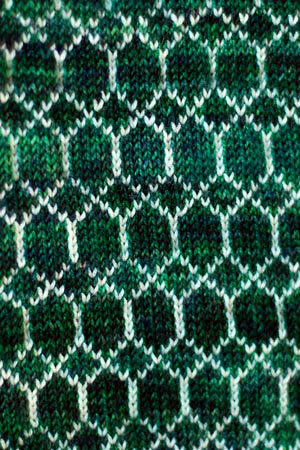 I’ve had that experience with very richly colored shades of koigu that I’ve used in colorwork – it’s so very nerve-wracking. That vest is just adorable. Beautiful job! And the pod of whales – they seem destined to also be stellar. Did you make the little tag too? I love that! So beautiful~ I love them both. Oh, that vest is just the sweetest!!!! And you know I love the whale cardi. Can’t wait to see what buttons you choose! I love it! 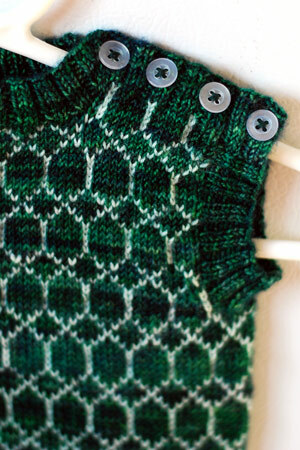 I worked with Tosh Sock in Clematis (dark purple) and loved it, and Malachite looks gorgeous! Those are both SUCH fantastic knits – that little vest just breaks my heart it’s so cute. Wonderfully done, as usual! I thought I learned about Madelinetosh Sock from you–didn’t you knit a pair of socks in Lichen? The vest is fabulous. The vest is adorable. The buttons are a great idea. I really love the whale sweater too. 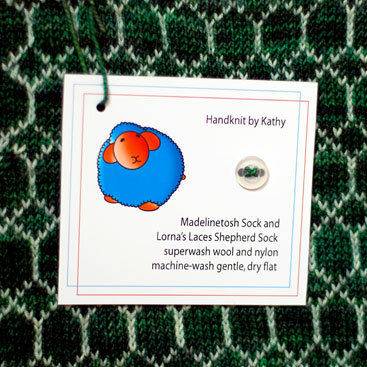 what beautiful heirloom kid knits! lovely. I think the sweater is adorable. I love how it has buttons for the ‘large headed child syndrom’ perfect. It’s so beautiful, the colors, the tag and your impeccable knitting skills. This makes me miss knitting even more. (I’ve been having tennis elbow and off knitting in the last 4 months. Sigh). Absolutely adorable. I really am going to buy that book. So much love for this little vest. Those are great projects — adorable! Your baby knits are absolutely adorable. I’ve been resisting buying the Madeline Tosh sock yarn, because it’s too easy for me to keep buying sock yarn faster than I’m knitting it. Your photos are stunning though, and it’s a great reminder that I don’t always need to knit the sock yarn as socks. It’s a beautiful vest, and I like the yarn you have chosen. bummer that the yarn bled, but the green is really a perfect color now. it’s so cute and wee! i love it! Argh. I’m expecting another little ‘un in April and I’ve been telling myself that I do. not. have time to knit anything for it, and here you go and flash some of the most adorable baby knits! Both babies would be lucky to get such stylish apparel. I’m assuming the whale sweater is bottom-up? I say that only because I noticed the underarm hole. 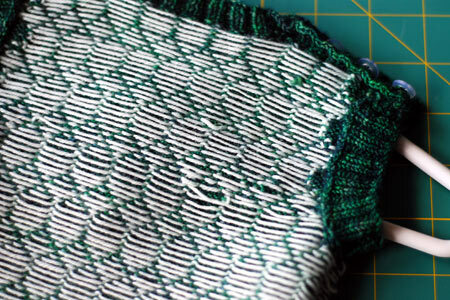 I’m currently in the middle of some EZ-bottom-up-seamless-sweater-making madness and have been plagued by the holes at both ends of the grafted underarm seam. Do you have any fantastic trick to fix that hole? If so, I’d love to see it! Love your info tag on the sweater!